A 16-year-old girl died Wednesday when raging floodwaters swept three cars off a road near Des Moines, and hundreds had to evacuate their homes as widespread flooding struck Iowa after three nights of rain. In Ames, flooding contributed to a water main break that forced the city to shut off water to its roughly 55,000 residents and left Iowa State University's basketball arena under 4 to 5 feet of water. Rivers and creeks rose after storms dumped 2 to 4 inches of rain on central and eastern Iowa over night Wednesday, with 6 inches in some spots, the National Weather Service said. A snowy winter and wet spring and summer "set the stage" for the flooding, but the recent storms were the big problem, weather service meteorologist Jim Lee said. "The bulk of this has been caused by those recent extreme rainfalls, especially back-to-back-to-back," he said. Divers found the body of Jessica Nichole Webb, of Altoona, near the submerged cars in Mud Creek about 2:20 p.m., more than 10 hours after she disappeared. Authorities said fast-moving water hindered their search efforts earlier in the day. The cars were swept off the road between Altoona and Mitchellville about 4 a.m. Rescuers found 10 of the 11 passengers clinging to trees and hanging onto logs. Four were taken to the hospital with non-life threatening injuries. Doug Phillips, a division chief with the Polk County Sheriff's Office, said the creek is usually only 3 feet deep and 10 feet wide but early Wednesday morning, "it looked like a river." Hundreds of residents in one Des Moines neighborhood were asked to leave Wednesday afternoon because of flooding by Four Mile Creek, and utility workers turned off natural gas and electric service to homes. A shelter was opened at an elementary school, and police said everyone needed to leave immediately. "It's such a serious and dangerous situation any time there is water around these homes because of the electricity and gas," Police Sgt. Lori Lavorato said. In Ames, about 30 miles north of Des Moines, officials shut off the city's water supply at 2:30 p.m. Wednesday after saturated soil shifted under flooded Squaw Creek, causing a buried 24-inch main to fail. The break drained a city water tower, dropping pressure in the distribution system and raising the possibility the system's water could become contaminated. Officials warned anyone who still had access to water to boil it before consuming it. They said repairs could take up to 24 hours, and it might be a week before the water was safe to drink. Several hundred Ames residents were evacuated from their homes after 3 to 5 inches of rain pushed Squaw Creek and Skunk River over their banks, Fire Chief Clint Petersen said. In some spots, water was up to car windshields. 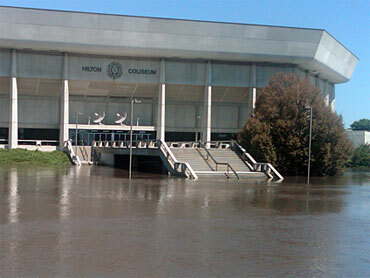 The floor at Hilton Coliseum, Iowa State's basketball arena, was covered with up to 5 feet of water, school spokesman John McCarroll said. It was too soon to know how much damage had been done, he said. Jack Trice football stadium was still dry, surrounded by sandbags football players had stacked as a precaution. But the parking lot between the two stadiums, where tailgaters party before games, was flooded. "I hope they get it cleared out by football season," student Sam Stonehocker said. In all, eight campus buildings had flood damage, McCarroll said. The Iowa Department of Transportation closed Interstate 35 just south of Ames and both lanes of U.S. Highway 30 in the area were closed. Elsewhere in Ames, Howe's Welding and Metal Fab had several feet of water inside it, even though the owners had been sandbagging all night. Piper Wall, whose husband owns the business, said it was difficult to assess the damage while the water remained, but it appeared worse than in 1993, when much of the area was underwater. "It will be when all this comes out and all the mud that remains and the machining tools and electric stuff that's not high enough," Wall said. "In 1993, it was $150,000 and this year it's higher." Downriver from Ames, the town of Colfax was nearly cut off by the rising Skunk River. Roads were covered by water, and people used boats to help neighbors move to higher ground. Colfax Mayor David Mast said he expected more than 200 homes would flood, and some were already inundated with about 4 feet of water. City officials had asked at least 300 residents on the west side of town to move to higher ground, Mast said. After Heather Kern was asked to leave at 12:30 a.m., she rushed to move possessions out of the home she shared with her husband, two children and three other relatives. When sirens sounds a few hours later, the family had to evacuate. Kern's basement was flooded, and water was inching into the first floor with waste-high water in the backyard. "I feel blessed that we have our lives," Kern said. "We don't know where we're going to live or where we're going to stay, but we have our lives." Colfax flooded in 1993, when the Skunk River reached a record of over 21.5 feet, more than 4 feet over flood stage. The river on Wednesday was 22.5 and still rising.